Combating climate change is the signature issue for the Washington Democrat. Following up on his official entrance into the 2020 presidential race, Washington state Gov. Jay Inslee on Monday used an appearance on ABC's "The View" to stress his main campaign theme: that climate change should be the "number one priority" for America's next commander in chief. "America is going to defeat climate change. It is our destiny and we will do this, and I'm convinced of this," Inslee, a Democrat, said. "But to do this, we have to have a leader who will say fundamentally and unequivocally that this is the number one priority in the United States." Inslee also responded to criticism from President Donald Trump and many in the Republican Party who say the costs of combating climate change are not worth the benefits, and that focusing on an issue that many Americans do not rank among the most important to them is a mistake. "When Donald Trump said that we're not going to have toasters and TVs if we have wind power, that's just simply moronic is the best way I could say it," Inslee said after Trump criticized the Green New Deal proposal put forth last month by Democratic Sen. Ed Markey of Massachusetts and Rep. Alexandria Ocasio-Cortez of New York. "He is just such a pessimist and a narrow-minded thinker, he needs to get with the rest of Americans and understand that a country that sent a man to the moon can develop a green energy economy." (Karen Ducey/Getty Images) Washington Gov. 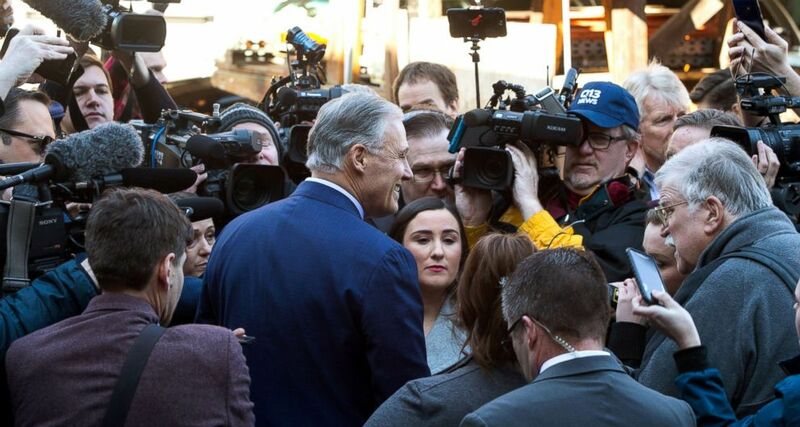 Jay Inslee is surrounded by the press after he announces his run for the 2020 Presidency, March 1, 2019 in Seattle. Inslee dismissed criticism of the cost of the Green New Deal, likening it to Republican claims that Democrats were going to institute "death panels," during the debate prior to the passage of the Affordable Care Act. "We are not going to eliminate cars. We are not going to eliminate trains ... When we think about our opportunities here, we can't be so narrow-minded. Look, I grew up in the time of rotary phones and now we got cell phones. We are going to have the greatest transformation of our economy if we unleash this potential," Inslee said. Inslee, who officially launched his campaign last Friday, was the first governor to enter a growing Democratic field of contenders that includes six U.S. senators, and as of Monday morning has swelled to 14 candidates total with the entrance of former Colorado Governor John Hickenlooper. "We went to the moon, and created technologies that have changed the world," Inslee said in his announcement video posted Friday. "Our country's next mission must be to rise up to the most urgent challenge of our time: defeating climate change." "I can think of no higher pleasure than to take on Donald Trump on a big stage. I’ve done it in the White House. I’m the governor who went to the White House and told him he needed to quit tweeting and start listening to Americans. I feel very comfortable in that confrontation," Inslee told ABC News in an interview following his campaign launch on Friday.